﻿ Pension Hibiscus Guesthouse, Seychelles Islands | FROM $81 - SAVE ON AGODA! "The staff is also very friendly and helpful!" Have a question for Pension Hibiscus Guesthouse? "The wi-fi was among the best we experienced during our stay at the Seychelles." "The Hibiscus was clean, spacious and very well equipped." "Just top notch place and immaculately clean." "Very nice guesthouse with lovley staff." When visiting Seychelles Islands, you'll feel right at home at Pension Hibiscus Guesthouse, which offers quality accommodation and great service. From here, guests can enjoy easy access to all that the lively city has to offer. With its convenient location, the hotel offers easy access to the city's must-see destinations. Take advantage of a wealth of unrivaled services and amenities at this Seychelles Islands hotel. A selection of top-class facilities such as free Wi-Fi in all rooms, luggage storage, Wi-Fi in public areas, car park, family room can be enjoyed at the hotel. Experience high quality room facilities during your stay here. Some rooms include television LCD/plasma screen, towels, internet access – wireless (complimentary), air conditioning, mini bar, provided to help guests recharge after a long day. The hotel offers fantastic facilities, including garden, to help you unwind after an action-packed day in the city. 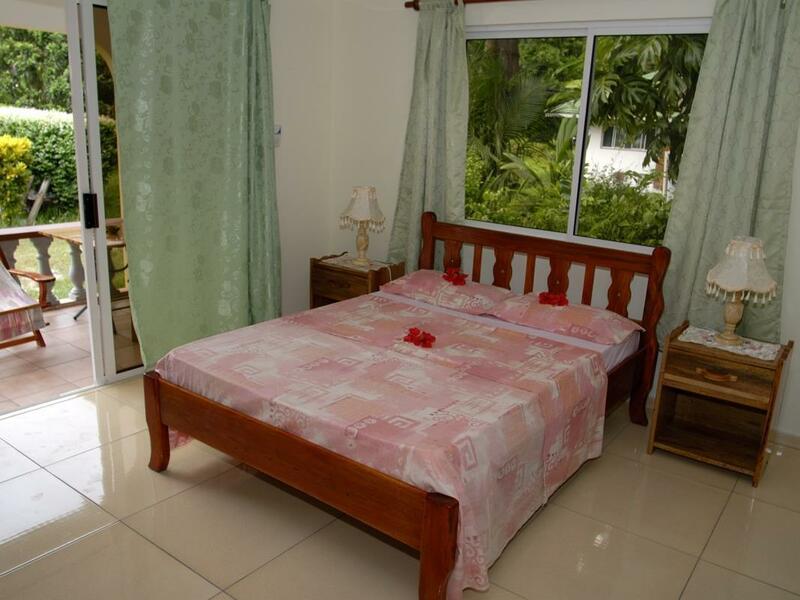 Whatever your purpose of visit, Pension Hibiscus Guesthouse is an excellent choice for your stay in Seychelles Islands. "Great place to stay, super helpful, friendly staff, spacious..."
Children 5-11 years old will be charged EUR 15 per child per night with extra bedding provided. Accommodation is easy, but you have all you need. We had room with doublebed, own kitchen, own bathroom, air conditioning, metal safe, wi-fi and own balcony. Cleaning of room by personnel is every day. This is a very good place, great location and very thorough to details. Gave us amazing service. Jeannette was very nice to us, gave us free fruit platter one morning, another day with fritters. She helped organize snorkelling tour for us as well as ferry tickets and gave us a ride to the Jetty. Just amazing place. The place was perfect. There was nothing more we could have asked for the money. She has bikes at the place and locks (have cash to pay). She welcomed us with fresh juice and a cold cloth. Just top notch place and immaculately clean. The kitchenette was perfect and the a/c was ice cold. We will definitely be staying here the next time. We loved it. Thank you Jenetta!! Pension Hibiscus team was really great during my stay. The room has kitchen and was very clean. It's located very close to supermarket as well. Every staff here is so nice and helpful, and they helped me out a lot suggesting where to go, what to eat, etc. Def will come back here and highly recommended! Great place to stay, super helpful, friendly staff, spacious and clean room. First of all, this is not a guesthouse to spend a few days on La Digue Island, this is THE guesthouse!!! Wonderful hosts, very friendly and helpful. Great location. Extremely clean. Fully equipped kitchen. Very comfortable bed. Large terrace with everything you need to relax on. Beautiful garden, full of flowers, mainly... hibiscus!!! Very quiet and peaceful. It could not be better!!!!!!!! We utterly and completely love The Pension Hibiscus and from the bottom of our hearts we would like to recommend it to anyone who is looking for something special and extraordinary. Dear Jennita and Alice, thank you once again for truly wonderful and unforgettable hospitality. We wish you all the best and hopefully see you next year. The Hibiscus was clean, spacious and very well equipped. The location is great, in a quiet spot yet so near Source d' Argent beach and lots of cafes and restaurants. Jeanita (hope I got the spelling right) and her staff are very helpful and kind, and I found this reassuring as I was a solo traveller. A special mention for the beautiful sarongs made my Alice, Jeanita's daughter. Very nice guesthouse with lovley staff. The rooms are basic but have everything you need. Very clean. The wi-fi was among the best we experienced during our stay at the Seychelles. Beautiful rooms, equipped with everything, very clean and decorated to perfection; kindness and really good-hearted people ... I will definitely return! Guesthouse is really great place to stay. Location is good, apatament and bed very comfortable. Staff is very helpfull and they really care to keep the place in good condition. Kitchen is very well equiped, shops are just round the corner as well as the bike rental. Dffinetyl worth recommending! This guesthouse is right off the main road yet far enough so you don't hear the foot traffic. The kitchen is very well stocked with supplies so just buy your food and cook away! The staff is also very friendly and helpful! The stay at Pension Hibiscus was so much more than expected. Absolutely nothing to fault - the rooms were clean, the balcony was spacious and the staff very thoughtful. For example when it started raining during our daytrip then they had collected our wet clothes from outside where they were drying and put it to our balcony so it would not get wet again. Location was also really good with grocery store couple of minutes walk away and reasonably priced take-away place almost as close. Definately recommend to anyone going to La Digue.